Japan Airlines is to install the bamboo wheelchairs at two airports early next year as part of a pilot scheme to reduce the length screening process associated with conventional metal chairs. 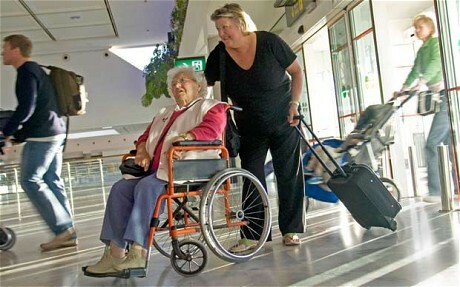 Wheelchair users have long suffered the problem of triggering alarms while passing through airport metal detectors, which often results in them having to undergo physical body checks before proceeding to their flight. The new wheelchairs, which each take a month to handcraft, are completely metal-free, with wheels, axle and brakes designed with materials that will not trigger security alarms. The wheelchairs, which have a bamboo framework, handrims and foot rests, took four years for researchers to develop and each one costs about £4,630 (600,000 yen). The wheelchairs were created as result of a collaboration between the airline, the National Institute of Advanced Science and Technology and Sun-so-ing, a custom furniture maker based in Oita prefecture. A number of the new bamboo wheelchairs will be unveiled early next year in Haneda airport in central Tokyo and also in Oita airport as part of the trial pilot scheme with a view to expanding depending on customers' response. The new bamboo wheelchairs were unveiled in Tokyo by celebrity supporters, including Norhiro Akahoshi, a former baseball player with the Hanshin Tigers who was once in danger of requiring a wheelchair after suffering serious spinal cord damage in an accident.